Previously available only with a manual option, automatic transmission option makes a debut on the face-lifted Brio for the top spec variant. Honda Cars India has updated its product portfolio with the launch of the new Brio at Rs 4.69 lakh for the base (E MT) variant and Rs 6.81 lakh for the top-spec (VX AT) variant (both ex-showroom, Delhi). The update for Honda’s entry-level vehicle comes with a good list of new upgrades and features for the exteriors as well as the interiors, making the Brio a better competition in its segment. 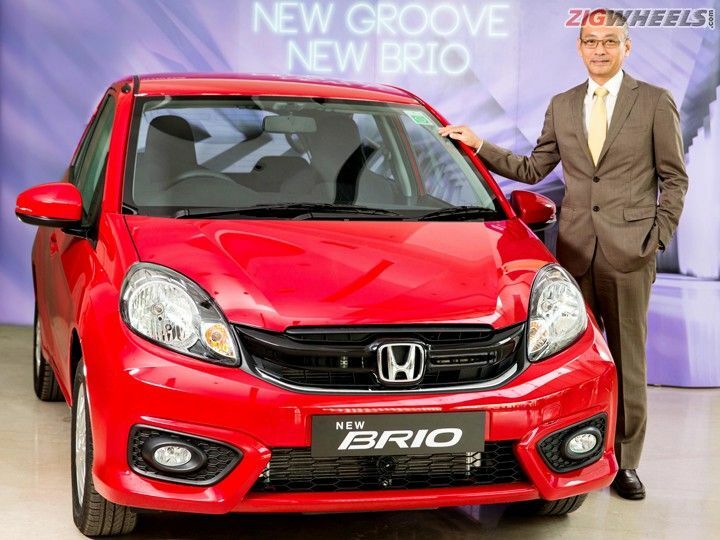 On the exterior, Honda has given the Brio a new, bold look. It gets a new front bumper, as seen on the new Amaze, while a new high-gloss black and chrome finish front grille finishes the front look. Moving to the rear, the car receives a new tail lamp design with a new tailgate spoiler. An LED high-mount stop lamp has been added to complete the sporty look of the car. Moving to the inside, the new Brio comes with spacious beige interiors and sporty black interiors for the top spec variant. It also gets an all-new instrument panel, giving it a premium feel. Carbon finish and silver accents have been added to the interiors with smoothly integrated air vents. The instrument cluster features a newly designed, triple-analogue, sporty meter that comes with white illumination. The upholstery comes with enriched seat fabric under the update. Other new creature comforts include a 2-DIN advanced integrated audio system that comes with USB, AUX-In and Bluetooth connectivity. The new Brio also comes with digital aircon controls with Max Cool Function for quicker cooling of the cabin. Under the hood, the car is powered by the same 1.2-litre i-VTEC petrol motor that develops 88PS of power and 109Nm of peak torque. Transmission duties are handled by a 5-speed manual gearbox and a 5-speed automatic transmission in the top-spec variant. Honda claims that the new Brio is capable of returning a mileage of 18.5kmpl for the manual and 16.5 kmpl for the automatic variants. In terms of safety features, the new Brio comes with Advanced Compatibility Engineering (ACE) body structure, improving the self-protection of the vehicle in an event of a collision. It also gets dual SRS airbags, Anti-Lock Braking System (ABS), Electronic Brakeforce Distribution (EBD), Seat Belt Pretensioner with load limiters and impact mitigating headrests. Lastly, the front body structure is also equipped Pedestrian Injury Mitigation Technology designed to absorb impact energy. The new updated Honda Brio comes with a standard warranty of two year/40,000kms and is available in five colour options - Taffeta White, Alabaster Sliver, Urban Titanium, Rally Red and White Orchid Pearl.